SANTINI - Duché de Savoye qui comprend..
SANTINI, P. / REMONDINI, M. - Duché de Savoye qui comprend..
Duché de Savoye qui comprend.. - SANTINI, P. / REMONDINI, M.
Map maker : SANTINI, P. / REMONDINI, M.. Date : Venice, 1776 - 1784. Size : 19.0 x 20.2 inches. / 48.3 x 51.4 cm. Description :Finely and crisply engraved map of Savoy. 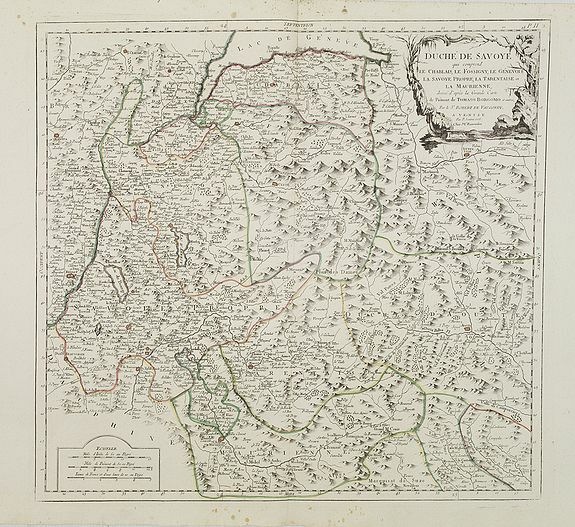 Venetian edition of de Vaugondy's map, from "Atlas Universel" printed in 1776-84. Large decorative title cartouche in the upper right corner. Relief shown pictorially. Condition : Some marginal spotting. Else very fine condition.